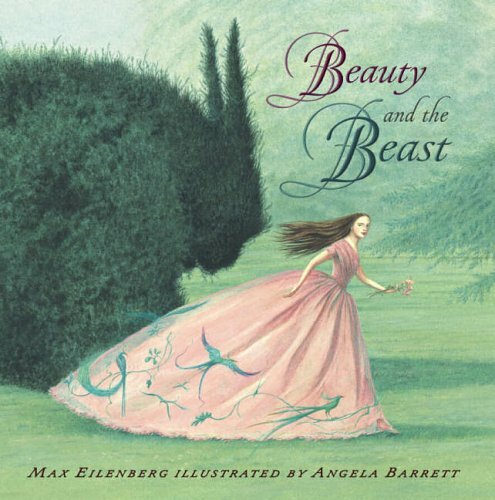 Once more Angela Barrett has produced her own vision of a well-loved tale. As the story begins, costume and décor place it firmly in the comfortable middle-class world of the middle of the nineteenth century and, in an impressive snow bound double spread, we see the merchant approach the Beast’s palace as if it were a magnificent stately home set in its own parkland, complete with Mock Gothic fairy-tale turrets. Yet, once within the palace, time dissolves and the real fairy tale takes over. Apparently solid walls are drapes on which woodland scenes are painted. Beauty and her father dine in a vast hall lit by candelabra of strange animal and human shapes. The Beast himself is both feline and serpentine, solid and hairy, and yet a creature of shadow. The illustrations are sometimes misty and indistinct, as if in half-light, and then suddenly and strikingly solid. Colour drains from the pictures, as the merchant, then Beauty, then the Beast, languish in loneliness but then bursts through in the heart’s blood of the roses. The illustrations are so beguiling that I became impatient with those pages where the text pushed them to the edge, but that is unfair to Max Eilenberg, whose retelling is perfectly paced and gives Beauty’s father a character that is engagingly foolish and fond. Still, it is Barrett’s vision that demands attention.